A truly bold Flavor. Our Black Pepper beef jerky will leave you wishing for more. Do you like your jerky with a bite? If so, our whole-muscle Black Pepper Beef Jerky will be just what you crave. With Italian black pepper and garlic powder providing the fire, our jerky will satisfy any desire for a spicy snack while also giving you that whole-muscle chew that so many meat lovers crave. Why is whole-muscle jerky better than other types? While many jerky makers are satisfied with using compressed meat from different parts of the cow to make their jerky, we make sure ours is pulled in whole chunks, making it the highest quality of meat you can find. In fact, we insist on using only the best ingredients in every part of the jerky-making process. Our spices balance fire and flavor to meet your highest expectations. Our jerky makes an outstanding snack for those who spend time outdoors, including athletes and hunters. Our effective packaging allows you to take it just about anywhere. It’s the perfect portable snack for days when you need a little extra energy. 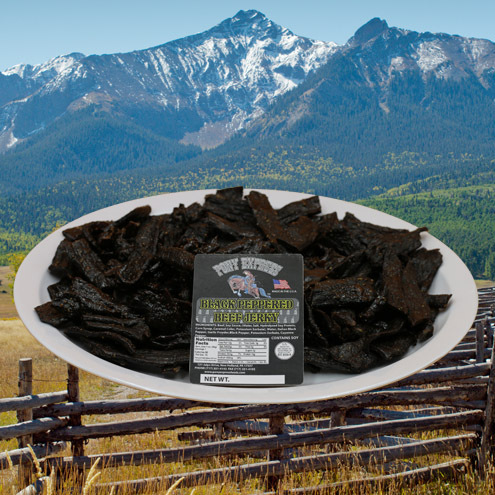 Want to stock up so that you won’t run out of our delicious Black Pepper Beef Jerky? Consider buying in bulk. You’ll get a fantastic price and ensure you always have some jerky on-hand. Perhaps you want to stock our beef jerky at a convenience store or other retail outlet. If so, you’ll be happy to know that we also have wholesale options available. Get in touch to learn about our pricing. We love providing the best jerky to our customers, so you can buy from us with confidence, knowing our managers have a combined 100 years of experience and are dedicated to providing you with the best products on the market.